Drama is an accepted genre of literature. It is another matter that in the Indian Natyashastra, the Dashrupaka limits the scope of drama as an independent art form and links it to visual aesthetics. There is a similar strain of thought in the West, where two distinct words are used to identify this performing art: drama and play. Obviously, drama is the written script, and play — if one goes by Shakespeare’s famous line, ‘The play’s the thing’ — is the production on stage. But whether we see drama as purely a literary genre or a theatrical one, it is indisputable that theatre sources the bulk of its material from literature. In the Indian context, right from ancient times, the Ramayana, the Mahabharata, the Puranas, historical legends and folk tales have been enacted as theatre. The Western tradition too has theatre based on the epics, such as Homer’s Iliad and Odyssey, and, at one remove, the historical tales of Holinshed. Greek theatre and a number of Shakespeare’s plays are based on legend and historical tales. In fact, Bible stories have also been a source for theatre. Literature has been a source for many other art forms as well. For instance, the Jataka tales of Buddhism are depicted in the Ajanta and Ellora frescoes while the biographies of the Mughal emperors, such as the Akbarnama and Jehangirnama, were illuminated by miniatures. One must also recall Leonardo da Vinci’s The Last Supper, based on the life of Christ. Dance and music, too, turn to literature as a valuable source. If we restrict our study to the relationship between literature and theatre, it is interesting to view the forms and levels at which this mutual exchange takes place. Significantly, it is narrative fiction, more than any other genre of literature, that theatre turns to time and again. I feel the story, the narrative form, provides drama with a framework. Not just drama, the story also inspires poetry, memoirs, reportage and other literary forms. It will not be out of place to say that a story is essential to most art forms. But in the case of drama, there are some specific reasons for the importance of the story. For instance, the story contains many covert dramatic moments which can be accentuated in drama. Besides, fiction offers perceptions on different aspects of life and provides an emotional context that can animate the content and ambience of drama. In fact, story preceded drama and it was through story-telling that drama arose as a form. Thus the art of narrating and writing a story has had a deep impact on the craft and structure of drama. In this context, it becomes more meaningful to study some of the actual experiments with fiction by theatre directors to see how fiction has fared in contemporary theatre. An early practice was to adapt a play from a specific work of fiction. Many writers adapted their own fiction into plays. For instance, John Steinbeck adapted his famous novel Of Mice and Men into a play of the same name. Nearer home, Mannu Bhandari adapted her novel Mahabhoj into a play. If the novels and playscripts by these two writers are read together, one finds little difference except in their structure. In other words, the writers transformed their novels into plays by either eliminating the descriptive passages or presenting them as part of dialogue. This is true of most directors and playwrights who adapt novels into plays. Of the many who have used this technique in Hindi theatre, I shall mention only a few. Ranjit Kapoor’s adaptation of Anand Kumar’s novel, Begum ka Takia, Chanakya Sen’s Mukhyamantri, Bibhutibhushan Bandhopadhyay’s Adarsh Hindu Hotel and Manohar Shyam Joshi’s Kuru Kuru Swaha are faithful renderings of fiction in dialogue form. If the need was felt to retain some of the descriptive passages, then the device of the sutradhar (narrator/chorus) was used or a prominent character of the play was given the additional task of the sutradhar. The point I am making is that when fiction was used on stage, no new form emerged. Of course, a long debate ensued on whether the novel was more powerful in its original form or in the adapted version. However, these experiments and those preceding them are historically important because they succeeded in providing direction for the emergence of a new form. But there have also been many cases where a director has given an entirely new, different, and creative twist to a play inspired by a particular story or novel. A fine example of this can be found in the experiments by two Indian directors with the famous Lu Xun story, The True Story of Aah Qu. 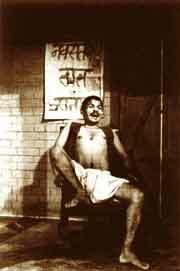 Although inspired by the same story, Arun Mukherjee’s Bengali play Jagannath and Bhanu Bharati’s Chandrama Singh urf Chamku bear little resemblance to each other. Since neither play is an exact rendition of the story in dialogue form, they hold their own as independent creations. Jagannath tells the tragic tale of a simple person against the backdrop of rural Bengal and Chandrama Singh urf Chamku unfolds itself in the dialect and locale of eastern Uttar Pradesh. Interestingly, though both plays end on a similar note, the ending is different from that of the original story. Each play follows a different sequence of events in reaching the conclusion. Both scripts evolved in the process of production and were published after the plays had been staged. Another story I can recall in this connection is Vijaydan Detha’s Khoji. Two Hindi writers made it the basis for their plays and two entirely different plays emerged from the exercise. Though the events of the story are common to both plays, Mrinal Pande’s Jo Rama Rachi Rakha comes across as a realistic play written in a folk idiom, while Asghar Wajahat’s Veergati is a musical that unfolds itself in the tradition of Parsi theatre. If one were to read Khoji afresh today, it would be difficult to imagine that such experiments could have been made with the folk tale. Perhaps the most amazing, exciting and well-known example of transforming a story into a completely different play is that of Habib Tanvir’s Charandas Chor. Tanvir based the play on a Detha story called Fitrati Chor, but what emerged was something totally different from the folk tale. The prime reason for this was ethnic or perhaps geographical. 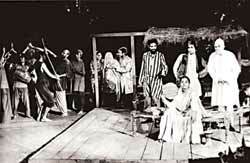 The Chhatisgarhi cast shaped the play with their unique talent, style and language. There were no songs in the original story, but at least a quarter of Tanvir’s play is related through song. The incidents in the first half of the play have little to do with the plot of the story. They are similar in the second half, but even here the director has freely remoulded them. Charandas Chor will always be remembered for showcasing how the characteristics and individuality of the actors of a repertory can influence a creative performance. For a comparative study, let us look at how fiction has been used in cinema. A story or a novel is mere raw material to a filmmaker, yet we find fiction unfolding in cinema in two distinct ways, akin to what we have seen in experiments on stage. A class of filmmakers has tried to faithfully depict fiction on celluloid. David Lean’s Dr. Zhivago is true to Boris Pasternak’s novel. On the other hand, there are filmmakers who use literature as a source but evolve something quite new. In the western context, the films of Bresson belong to this category. Indian filmmakers like Mani Kaul and Kumar Shahani have also made similar use of fiction. Television and video have also made ample use of fiction, but these attempts do not merit separate comment. In the world of Hindi theatre, three directors have exclusively used fiction in their plays. Anuradha Kapur chose Ghare-Baire and Gora by Tagore, Umrao Jaan by Mirza Rusva, and the autobiography of the Gujarati stage actor Jaishankar Sundari for her theatrical productions. She has always roped in a writer to adapt the stories for stage but despite her attempts to provide a fresh perspective to fiction as drama, a clear form has not emerged. What finally emerged was neither fiction nor theatre, but something in between. One major reason for this was that the adaptation kept falling back on the sutradhar device. However, these plays attracted much wider attention for their production style, since the director created an interesting visual idiom through the use of artwork. Maya Rao’s work in this direction is completely different. Her production based on Manto’s well-known story Khol Do did not use a single word from the story. In fact, she did not use the spoken word at all. Instead, the director-actress evolved a language of music and body movement in an endeavour to express the anguish of the character. Although an interesting experiment, the play failed to move the audience, which regarded it as obscure and distant. Manto’s brief story leaves a profound and lasting impression on the reader, but the hour-long play was reduced to an exercise in intellectual acrobatics. 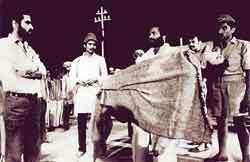 In this context, one recalls a production by Vijay Soni based on Andhere, a poem by Muktibodh. Hardly a word from the poem was used but the collage of music and movement made the production a satisfying experience because his use of the visual idiom could be easily grasped, even when it was used to address abstract issues. There is always the danger of a richly textured and descriptive form like fiction losing its relevance in abstract productions on stage. In other words, if the story loses its essential narrative and dramatic qualities on stage, then the experiment does not quite take off. However, it would be unfair not to acknowledge the fact that such experiments do help in creating a climate for a new exchange between literature and theatre in which spoken words are replaced by music and movement. Similar efforts have been made in dance — in fact, the aesthetics and grammar of dance have to a large extent inspired theatre directors to move in this direction.